The Skylinks at Long Beach Golf Course offers so much more than just beautiful golf. It offers a chance to host an amazing wedding, great food and a place for memories to be made. The golf course is located just south of Los Angeles and this par 72 course has 6,909 yards of Bermuda grass fairways and Poa annua greens. The course has a links-style to it, and it is the perfect place for players to see how good they really are. The course was renovated and reopened in 2004. Course architect Cal Olson did an amazing job of designing this course around the beautiful Long Beach atmosphere. From the Championship tees, the course boasts a 72.7 course rating with a slope of 127. 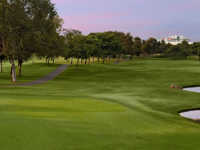 Golfers of all levels can compete on this course because of the five different tee locations. The chipping area, putting green and driving range are included with the Skylinks at Long Beach Golf Course discounts that are available. Long Beach tee times for this course can be made anytime by going online or you can call the pro shop to reserve your spot on one of the premier courses in California. Remember that Long Beach golf deals are available throughout the year, so you can save a little extra money when you are trying to navigate through this open golf course with plenty of challenging shots.